After a week back to work already, I’ve been pondering our summer and the wonderful memories we made together as a family. While I could write a book about the summer and everything that happened, I would like to share one memory. A sweet memory about my 4-year-old son, Pauli. But first, some background . . .
As I wrote about in my last post, we went on a road trip to Disneyland this summer. We weren’t even sure if we were even going to actually go to Disney this year. We went the last two years, but really, after last year, we wondered if we shouldn’t wait a few years to go again (the kids were a bit whiny and didn’t seem to enjoy themselves much last year). 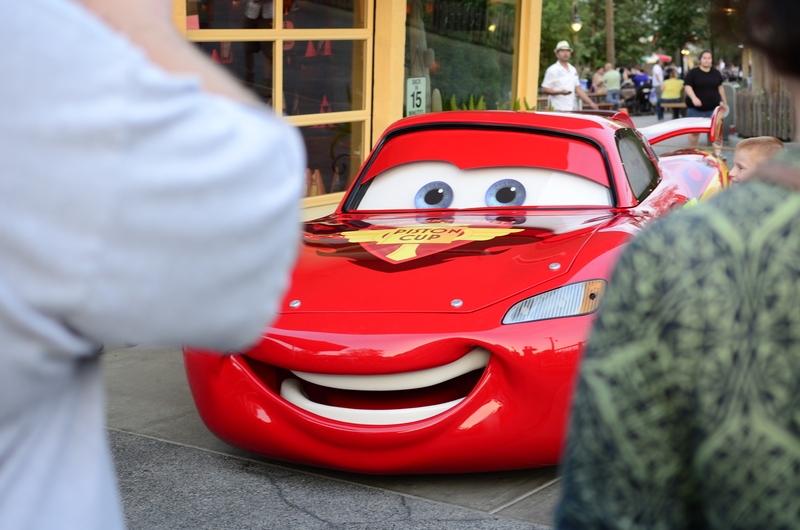 But, we knew that the new CarsLand had started in California Adventure and we knew how much Pauli would love to see Lightning McQueen! Our daughter was also very excited to go on some of the rides that she’d been on the year before. Honestly, I think she wanted to make up for the year before. So, off we went to a day at the Disney Adventure Parks. We had a lot of fun in the morning at Disneyland. After lunch, we decided to go home for a rest time (our 1 1/2 year old really needed a proper nap – as did Daddy). The older 2 and I played at the hotel pool for a couple of hours and then went for a rest in the hotel room as well. After an early dinner, we headed over to California Adventure. Just as we were waiting in line to get into the park, I look over and my exhausted son, Pauli, has fallen sound asleep in the mountain buggy (he “rested” but didn’t, in fact, sleep when we went back to the hotel). 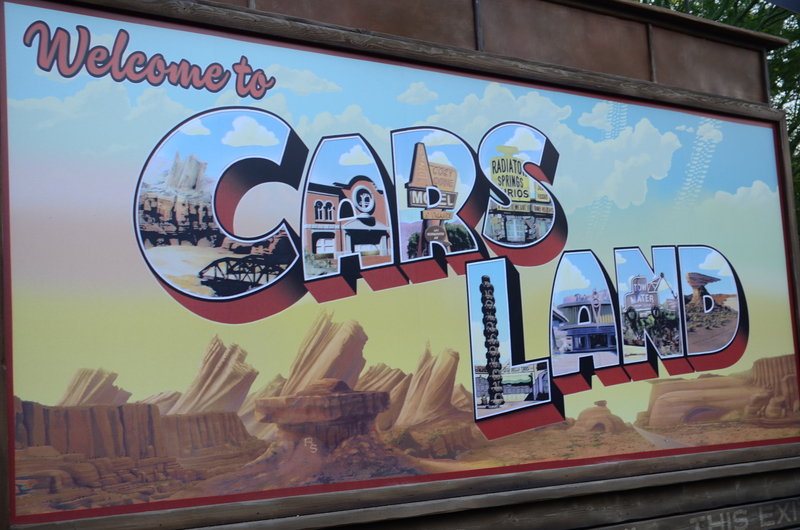 We tried to wake Pauli up when we got to CarsLand. No luck. Trista and I went on a few rides and explored a bit. Then, finally, we just couldn’t let him sleep any longer. We did whatever we had to do to wake him. 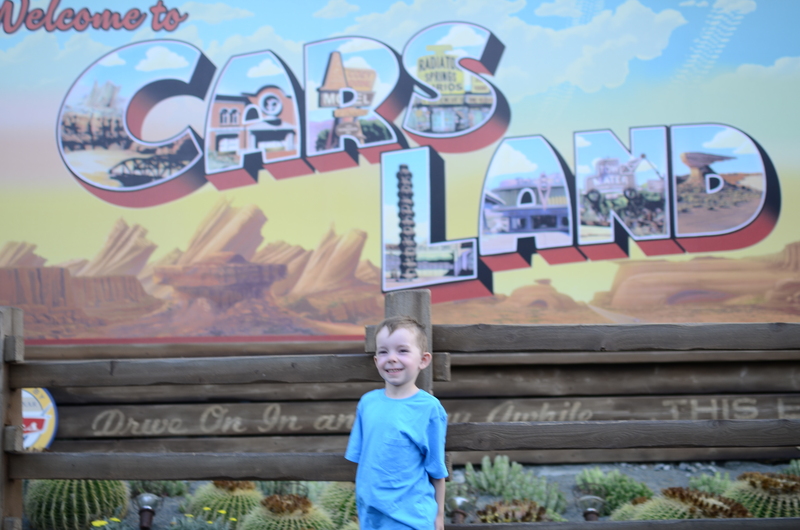 He wasn’t too happy – until he realized where he was – CARS LAND! Now on to one of my favourite memories of summer . . . 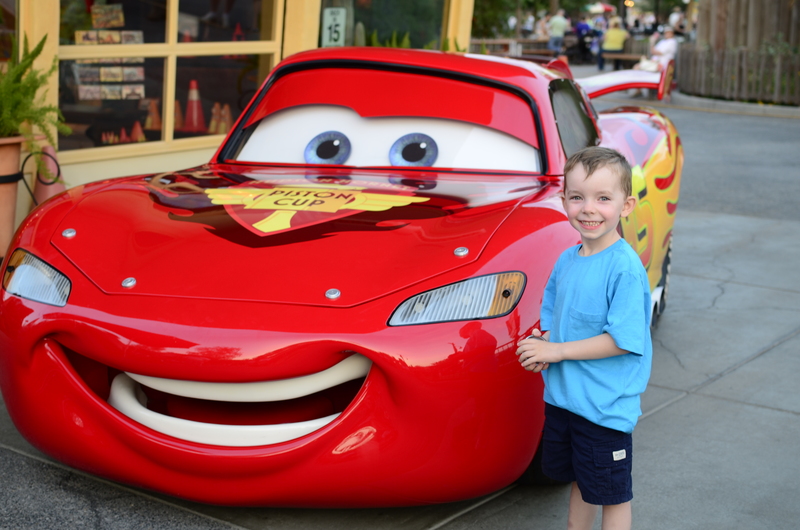 The best part of the evening was when he saw Lightning McQueen! Kids (and their parents) were waiting in line to “meet” Lightning and have their photo taken. So, that’s where we headed. The line up was only 15 or so kids long, but it wouldn’t have mattered. There could have been 100 children waiting in that line. We were there for the long haul. As we were waiting, the cutest thing ever happened. Pauli would not take his eyes off of Lightning. He was watching him like a hawk. He was so absolutely adorable and he truly “believed”. It was magical. Pauli talking to Lightning as he met him in person for the first time. This was truly one of the most special memories of our trip to Disneyland and one that Pauli will remember forever. So sweet! We tried to make sure the kids got enough sleep the night before (what a concept, I know). We headed to Disneyland early to beat the heat. We took a break in the middle of the day when it was the hottest – for a swim and a rest time. We were relaxed and didn’t worry about not doing “everything”, in fact, we actually went to very little in both parks. While I feel that I would have liked the kids to see more and do more while we were there, I left my expectations at the door and just went with the day. It wasn’t about me, it was about them and what they could handle during the day. Our kids truly had the best time. As they get older, they will be able to handle seeing more things (I think my husband may still need an afternoon nap though). What lessons did you learn from this summer? 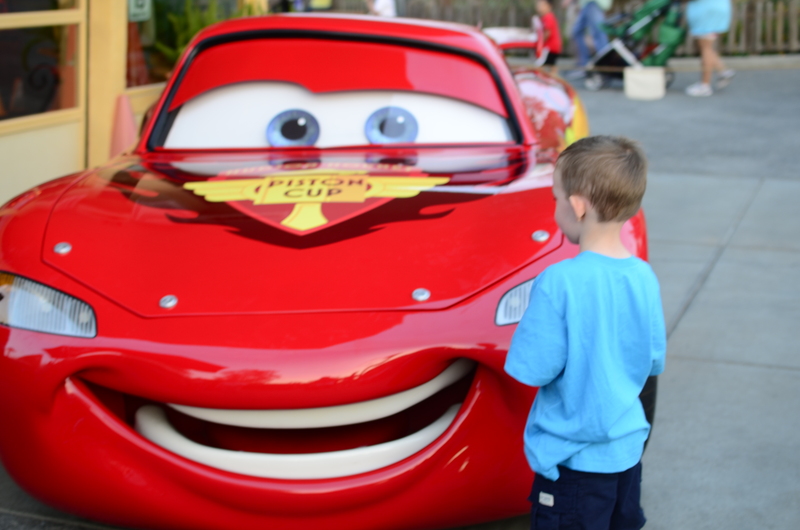 This entry was posted in Family, Reflection and tagged california adventure, CARS, disney, disneyland, fsmily, Lightning McQueen, magic, memories, memory, vacation. Bookmark the permalink.